I'm still patting myself on the back over dinner last night- mostly because I made it up, and Sky ate it. Well, most of it. With coaxing, and french fries as a reward for taking bites. But that's how most of our meals go, so it still counts as a success. Plus, I thought these burgers were off the hook and they rated a "pretty good" from D, who can be a tough food critic. These eggplant burgers were fast, easy, and still relatively healthy. You can make these vegetarian by leaving off the bacon and vegan by leaving off the bacon, using soy cheese and a different base for the garlic-chili sauce. Also, this recipe only fed three, so you'll need to expand the ingredients if you're feeding more than that. Slice the eggplant into 1-inch rounds and lightly salt both sides. Let it sit on paper towels for a half hour, turning it after 15 minutes. Mix the mayonaise, crushed garlic and chili oil to your desired spicyness and set aside (you don't need a lot, just enough to dress the buns). Rinse the salt off of the eggplant and pat dry. (I don't always do this step but it does make the eggplant softer). Brush both sides of the eggplant with olive oil and salt and pepper to your taste. Grill eggplant until cooked through, about 15 minutes. Top each slice of eggplant with one piece of bacon, broken in half, and half a slice of gruyere. Close grill lid so that cheese melts (you can toast your buns while you do this step). 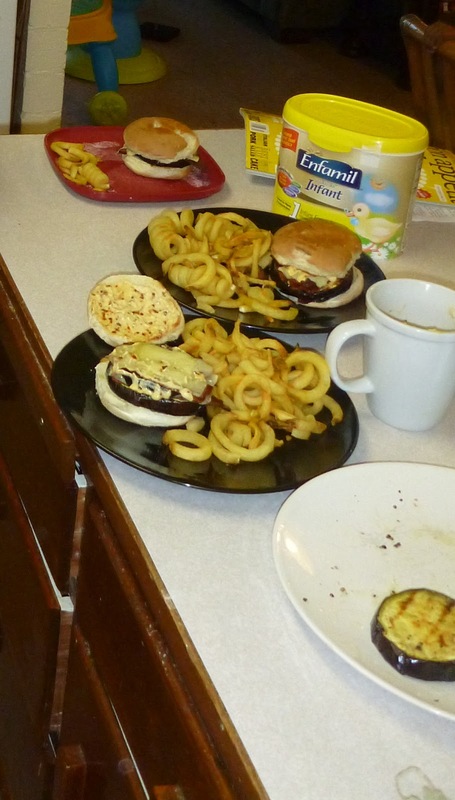 Once the cheese is melted, stack two slices of eggplant on top of each other and put each double-stack on a bottom bun. Spread the top bun with garlic-chili sauce and serve. a double eggplant burger with bacon, cheese, and special sauce!